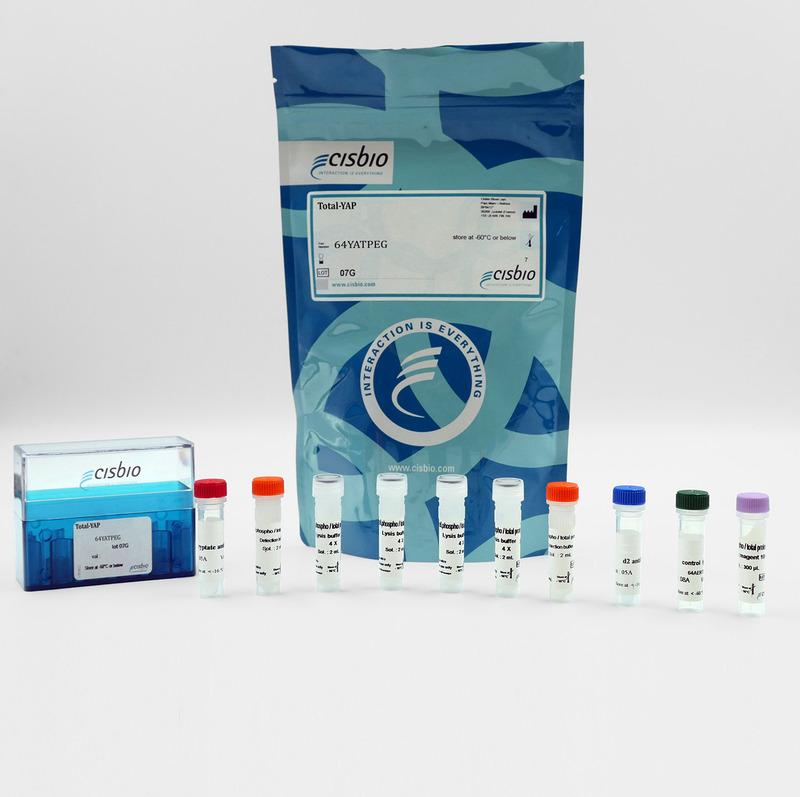 The Total YAP cell-based assay is designed to monitor the expression level of YAP proteins, both phosphorylated and unphosphorylated. 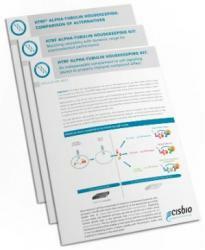 It uses the same buffers as our Phospho-YAP kit, and enables the analysis of phosphorylated and total proteins from a single sample for a better readout of the Hippo-YAP pathway. With its central mediator role in the Hippo Pathway, YAP is an important target for oncological disease studies. 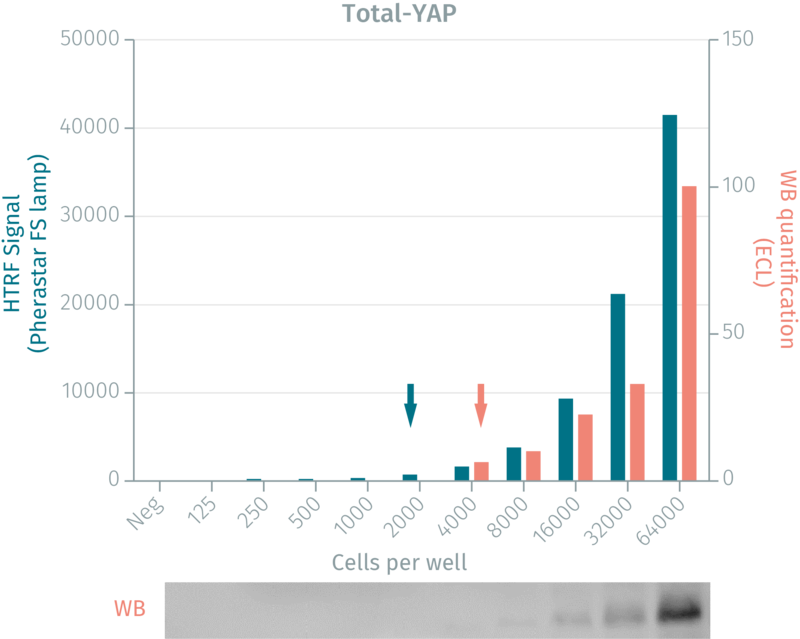 The Total-YAP assay quantifies the expression level of YAP in a cell lysate. Contrary to Western Blot, the assay is entirely plate-based and does not require gels, electrophoresis or transfer. The Total-YAP assay uses two labeled antibodies: one coupled to a donor fluorophore, the other to an acceptor. Both antibodies are highly specific for a distinct epitope on the protein. In presence of YAP in a cell extract, the addition of these conjugates brings the donor fluorophore into close proximity with the acceptor and thereby generates a FRET signal. Its intensity is directly proportional to the concentration of the protein present in the sample, and provides a means of assessing the proteins expression under a no-wash assay format. The 2 plate protocol involves culturing cells in a 96-well plate before lysis then transferring lysates to a 384-well low volume detection plate before adding Total-YAP HTRF detection reagents. This protocol enables the cells' viability and confluence to be monitored. 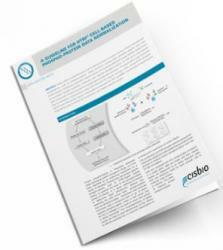 Detection of total YAP with HTRF reagents can be performed in a single plate used for culturing, stimulation and lysis. No washing steps are required. This HTS designed protocol enables miniaturization while maintaining robust HTRF quality. Human (HEK293, HEK293 A, U-2 OS, HeLA, MDA-MB-231, MCF 10A) and murine (NIH 3T3) cells were plated at 100,000 cells/ well in a 96 well plate in serum-deprived cell culture medium, and incubated for 24h at 37°C, 5% CO2. Medium was then removed and cells were lysed with 50 µL of lysis buffer for 30min at RT under gentle shaking. 16 µL of lysate was transferred into a 384-well sv white microplate and 4 µL of the HTRF Total YAP Ser127 detection reagents were added. The HTRF signal was recorded after an overnight incubation. Human MDA-MB-231 cells were grown in a T175 flask at 37 °C, 5% CO2 for 48 h. After medium removal, the cells were lysed with 3 mL of supplemented lysis buffer for 30 min at room temperature. Soluble fractions were then collected after a 10 min centrifugation. Serial dilutions of the cell lysate were performed in the supplemented lysis buffer, then 16 µL of each dilution were dispensed and analyzed side-by-side by Western Blot and by HTRF. The HTRF total YAP assay is 2-fold more sensitive than the Western Blot. 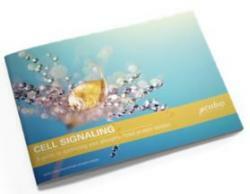 Using HTRF , 2,000 cells are sufficient for minimal signal detection while 4,000 cells are needed for a Western Blot signal. 100,000 of the HEK293A were plated in 96 well plate in serum-deprived cell culture medium, and incubated for 24h, at 37°C - 5% CO2. Serum was added for different times. After cell culture medium removal, cells were lysed with 50 µL of lysis buffer for 30 min at RT under gentle shaking. 16 µL of lysate were transferred into a 384-well sv white microplate and 4 µL of the HTRF total YAP detection reagents were added. The HTRF signal was recorded after an overnight incubation. Overnight exposure to serum is needed to obtain the optimal quantity of the total YAP protein. The Hippo/YAP pathway regulates organ size by playing a role in the balance between proliferation & apoptosis. This pathway is involved in mechanical and cytoskeletal signal transduction. The Hippo/YAP pathway is activated by numerous stimuli, such as cell attachment, high cell density, mechanical tension, or in the absence of growth factors. The activation of this pathway first activates MTS kinase, which in turn phosphorylates Lats kinases. YAP is then phosphorylated on Serine 127, leading to its cytoplasmic retention and eventually to its degradation by the proteasome machinery. Thus phosphorylated YAP represents the inactivated form of the protein. 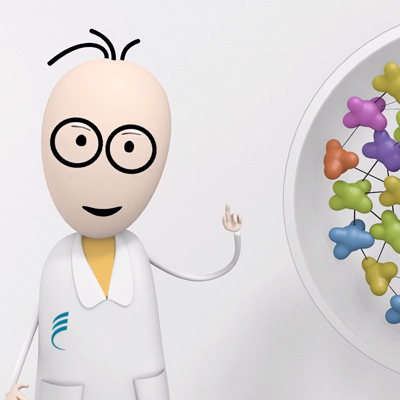 YAP/TAZ mutations have been reported in certain types of cancer (e.g. breast, lung, ovary, and colon).